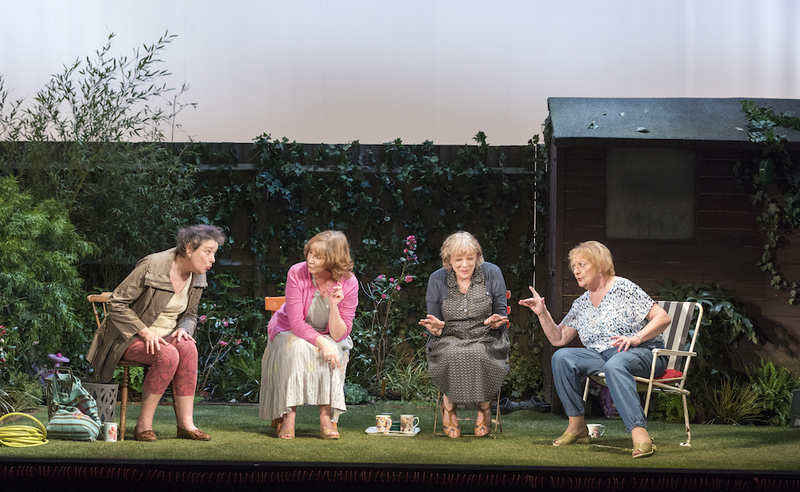 In Caryl Churchill’s latest play, four aging women chat away an afternoon. How scary can it be? The answer, it turns out, is very scary. And, somehow, it’s also quite funny. One wouldn’t expect anything less from Churchill, the fierce British dramatist whose Escaped Alone is currently enjoying its first American run at the Brooklyn Academy of Music. Directed by James Macdonald, this 50-minute production from London’s Royal Court Theater unsettlingly juxtaposes a cosy conversation in an English garden with an end-of-the-world scenario. We first meet Mrs. Jarrett, played by Linda Bassett, who comes across three women sipping tea in a scenic backyard and immediately invite her to join them. The women, who are all over 70, while away the afternoon with the kind of small talk familiar to those faced with post-retirement relaxation—about husbands, recipes, the latest TV series they’re all watching (but no spoilers). Not all is amicable chatter and gossip. In hauntingly staged monologues, the impact of which is immeasurably enhanced by Peter Mumford’s lighting, the women share their deepest, darkest fears. Sally (Deborah Findlay) is so afraid of cats, she frets about every single space they could hide in. Lena (Kika Markham) seems to be suffering from agoraphobia stemming from extreme depression. Vi (June Watson) says she was married to an abusive man whom she killed in self-defense—the memory haunts her. And Mrs. Jarrett’s seemingly cheerful personality conceals a seething, startling rage. Between the scenes of chitchat and the monologues, Mrs. Jarrett steps from the back lawn onto a completely dark set surrounded by red lightbulbs—the seamless transition enabled by Miriam Buether’s efficient sets and Christopher Shutt’s ominous sound design. Mrs. Jarrett calmly describes the events that happen at the end of the world, including chemical leaks and deadly winds that propel cars into the air, causing airsick families to take selfies, just in case there’ll be anyone to show them to. When a food shortage of food occurs, obese people sell slices of themselves. Mrs. Jarrett’s delivery contrasts sharply with the cadences of her and the other women talking, as, for example, when they spontaneously start singing the girl-group classic “Da Doo Ron Ron.” The powerful performances of these subtly restrained actresses depict the sadness and uncertainty, as well as the desperate need for distraction, lurking beneath their seemingly contented jawing. It’s not clear how Mrs. Jarrett’s apocalyptic narration is connected to the peaceful backyard scenes, and neither strand of the play is resolved. 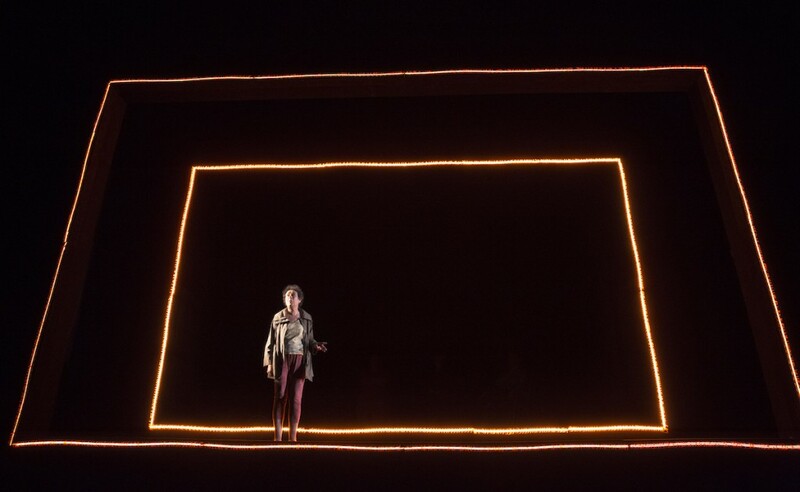 The play’s title, which recalls a line from the Book of Job, “I am only escaped alone to tell thee,” hints that Mrs. Jarrett is the sole survivor of a global catastrophe, but that is one of many possible interpretations. Escaped Alone premiered in London in January 2016, long before Donald Trump was elected. But the play resonates strongly with the concerns of American audiences, especially since Mrs. Jarrett discusses the confusion and chaos regarding government enforcement of travel documents as conditions worsen and humans attempt to flee. With American political activism currently surging through social media, Mrs. Jarrett’s words about people relying on screens rather than actual food, rather than human interaction, are equally powerful. Escaped Alone runs through February 26 at the Brooklyn Academy of Music’s Harvey Theater. 651 Fulton Street, Brooklyn, (718) 636 4100.